At Dhapekars Dental Care, we ensure that your First Dental Visit would be pleasant and satisfying. The dentist will listen patiently to your complaints and try to relieve the pain and suffering.This may be your first visit to the dentist or your first visit in a while. You may not know what to expect or may even be a little nervous. So sit back and relax and let us explain what to expect during your first visit. Checking inside your mouth we try to look for any abnormality in soft tissue like lips, cheeks and tongue. We will also perform an oral cancer screening. We will check your gums and jaw bones as they are the foundation of your teeth and check for any signs of gingivitis gum disease or bone disease. For kids we need little home work to prepare your child for first dental visit. 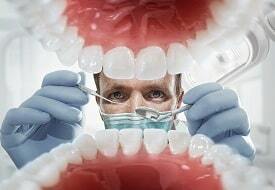 Read HERE about the tips do prepare him for dental visit. Checking your teeth comes next on the agenda where we see for cavities and other problem. Most cases clinical examination by itself may not be sufficient to completely diagnose all the dental problems in your mouth and in fact the majority of problems in your teeth and bones are not visible to the naked eye. Therefore the X-rays play a key role in allowing us to see what’s really going on inside your mouth and below your teeth and gums.